Now that the holidays are finally over I feel like I can spoil myself. I deserve it, I've been working very hard tending to all sorts of Christmas needs. 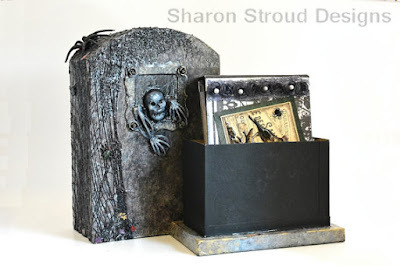 I stumbled upon these awesome boxes by Sharon Stroud Designs. I might have to splurge! 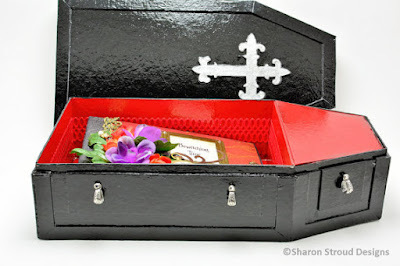 This is such a lovely Classic Black Coffin Gothic style Custom Box. 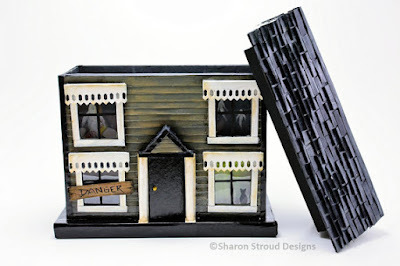 It measures 12 1/2" long x 6 1/2" wide x 3 3/4" high, painted with acrylic paints in glossy black and red with shiny silver handles. 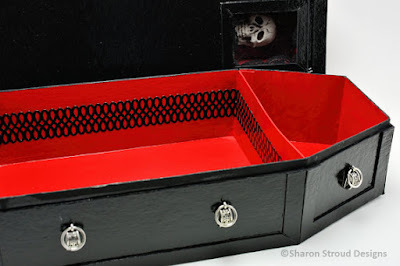 This coffin has a secret compartment headrest which would be a great place to store my jewelry or some photos. This Chilling Chateau Box is beautiful and eerie at the same time! It is perfect for storing or even displaying in my house. It would make for an interesting centerpiece. I love how delicately designed this Ghoulish Crypt Custom Made Box is. I really enjoy the net wrapped around the tomb and a spider creeping on the top. This custom box is so cute. 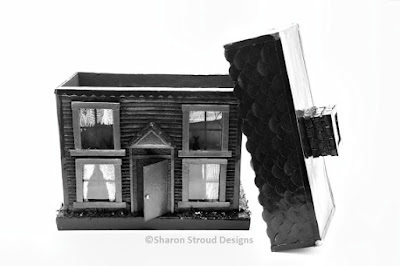 The Mayhem Manor Box is designed like an old Victorian house that appears to be haunted. You will find ghosts inhabiting the upstairs. Downstairs there is a cat sitting in the window and a large sign blocking the other window saying "DANGER". 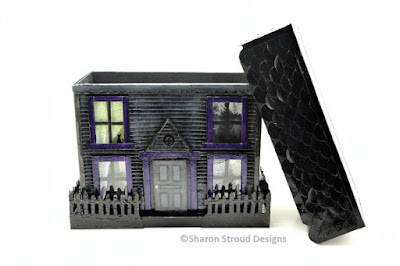 I feel like this Macabre Mansion Box was made just for me! All of the siding, trim, bricks are cut and glued by hand, not just painted on. The roof shingles are punched and painted. The windows are clear plastic with wispy gauze curtains. One of the windows has a cat gazing through the "broken" glass. It is really a beautiful piece of art! The Count's Coffin Box is a really cool box! There are lot of levels to this what looks to be a simple design. It is painted in a gorgeous black and purple shiny acrylic paint. I could see this being used as a cool display on my table. This Seymore's Coffin Box is super awesome. I love the lid with the acrylic window that gives an excellent view of Mr. Seymore. It is about 12 1/2 long x 6 1/2 wide x 3 3/4 high and has a classic coffin design. This one is probably my favorite and I would definitely use it as a jewelry box. I really enjoy the Beast Within Casket Box. 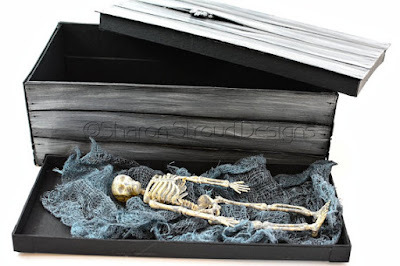 This box features a removable tray which comes with a creepy skeleton lying in ghoulish gauze. It would make for really cool home decor or even a deceiving jewelry box. 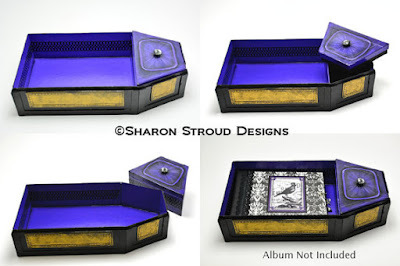 I hope you enjoy Sharon Stroud Designs like I do! There's no harm in indulging. Let me know what you think of her designs below!